Thaï Basil (Ocimum basilicum 'Thaï'): growing, planting, caring. A Thai basil - slightly anise-flavoured - suitable for Asian cooking ! Basil is not especially difficult to grow, however there’s a reason it’s known as the “king of herbs” — you’d better follow its commands! First command: you’ll need a spot that’s sunny, but not too parched. It’s important that the soil is continuously moist and well-enriched. Keep in mind that basil does not take kindly to cold snaps, heat waves, or drafts. Manage these conditions and you’ll be sure to please his highness. As for cooking recipes, we’ll leave it to you. Basil — Ocimum basilicum — is a species of therophyte in the Lamiaceae family, cultivated both as an aromatic plant and a seasoning. There are many varieties, often with diverse flavours, including "cinnamon", "licorice", "lemon", "Thai", "purple", "mammoth", "large green"... A plant typically measures between 20 to 60 cm high, with spear-tipped, oval leaves that grow 2 to 3 cm in length. The leaves may be light or dark green, or even purple for some varieties. The straight, branching stems are square in cross-section, like many labiates. The small, white flowers are bilabiate, with the upper lip separated into four lobes. They are small in size, and grouped in long, tubular, elongated bunches. Sowing basil from seed is a good method of obtaining a sturdy basil plant. 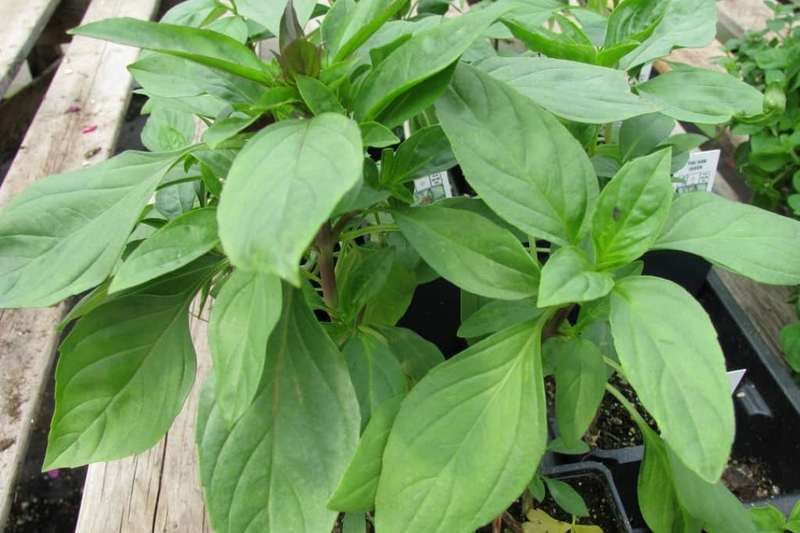 You can buy your seeds from a store or collect them each year after your basil has flowered — providing you didn't buy an F1 cultivar to begin — in order to sow them the following season. You can sow directly in place, starting in April for southern regions, or in May for other regions — the seeds will sprout once temperatures approach 18°C. Sow in light, well-drained earth, placing a few seeds in each seed hole, spaced 20-30 cm apart. Barely cover with earth or potting soil, as the seeds are extremely small. Water with a fine mist. Keep the soil moist during the first few weeks after sowing. You can also sow basil under a cold frame, from February to April. Do not cover the seeds that need light to germinate - just sprinkle a little potting soil on them. Put the seedlings in a clear room with a temperature of around 18 ° C. Behind the kitchen window, it works pretty well: just avoid full sun and big temperature differences. Keep the soil moist for the first few weeks, but never soggy, spraying gently and regularly. Remind me when to sow. Once your basil plants each have 2 to 3 leaves, thin them so as to keep the most vigorous seedlings, taking care to leave enough room for them to develop. Transplant seedlings sown under shelter to your vegetable garden after the last frosts, choosing the best plants. use well-drained, deep soil with a low clay content. Install the plant very delicately — the roots are still very fragile! Choose a location with full sun and shelter from winds. The soil must be well drained in order to prevent water from stagnating: the ideal is a substrate of potting soil with an addition of 10% sand. Basil likes to have a warm head and cool roots. But avoid soaking wet soils at all costs! Whether you're sowing under cover or buying an pre-grown plant, you can plant your basil in open soil at the beginning of May and leave it outdoors all summer. Basil is also perfectly suited for growing indoors, behind a window, on a balcony, potted, or in a box. If you wish to keep it potted, transplant it immediately in a bigger pot after buying — a simple terracotta pot will do the trick! Pinch off new sprouts once the plant reaches 10 cm of height in order to favour branching. Twist off the tip of the stem between your thumb and forefinger — this will allow lateral stems to develop. You can repeat the operation several times at the tip of each stem. If you don't want your basil to produce seeds, cut back the the ends of the stalks on a regular basis. Remove the flowers as they appear, before they tire our your basil! Basil likes regular water, but take care not to get the foliage wet in order to avoid diseases! Pro tip: never water during direct sunlight: this can burn the foliage, and this wastes water. Water in the morning or evening, but not too late. Mist the seedlings very delicately instead of watering them, if possible, to keep the subtrate moist. Once they have grown a bit, we'll say a month after thinning, you can start watering them directly, but be delicate! Favor pots with a water reserve if you're cultivating on a deck or balcony, or place saucers of water under the pots. You can mulch between the plants one to two weeks after planting with the aid of a mulch which holds in moisture. This will limit evaporation from the soil, and thus the need to water and to weed. You may pick basil leaves all spring and summer. Quick note! We tend to pick off the lower, most-developed leaves — this is a serious mistake! Let your plant keep it's lower, greenest leaves — these give the plant it's energy! If possible, cut off an entire stem in order to promote the growth of new sprouts. Take the time to remove buds, as their growth tires out your basil to the detriment of the leaves! You may pull your plants up at the end of the season to leave room for autumn planting — basil is an annual! You can also try to get it to last the winter by bringing in your pots and placing them in a cool, well-lit room before the arrival of the first frost. Basil does not withstand negative temperatures, so whether it is in pots or in open soil, it must be sheltered. In open soil , dig it up with a spade and place it in a container of at least 5 liters, being careful not to break the root ball. Then take the pot and place your basil inside in a very bright area. Once the temperatures exceed 15 ° C, you can take out your basil and gradually place it in the sun.